On Saturday, May 25th come join 1200 people, all dressed in their crispest whites, at one of the world’s longest dinner parties. The event is called Table for 1200, and it’s one of the peachiest dinner parties you’ll ever attend (we promise). Here’s the gist: you buy a ticket (or better yet, you and a group of eight friends so you can buy a whole table), you dress all in white, you show up, then you sit down for a lovely time while chefs Ben Kramer and Mandel Hitzer and their teams serve you a multi-course family style dinner that pays homage to Manitoba’s bounty. 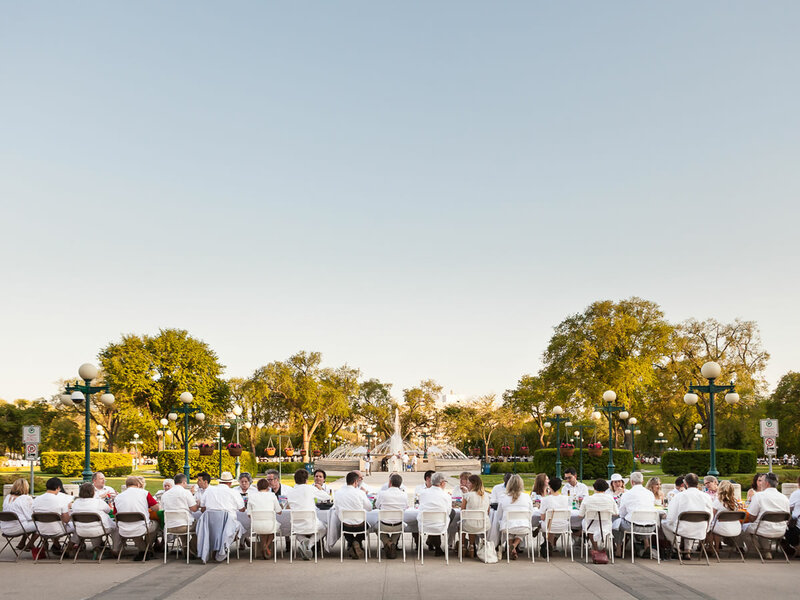 The inaugural Table for 1200 was held on the Esplanade Riel in 2014 and was organized by StorefrontMB and 5468796 Architecture Inc, who approached Hitzer and Kramer when they were looking to stage a design and culinary event while Winnipeg was hosting the RAIC Festival of Architecture. #tablefor1200more full tables are on sale until sold out! BOOK BY MAY 26th if you want rentals or add-ons! After the success of the first year (it sold out quite fast), StorefrontMB decided that this should continue, and the event has since gone on to work as a fundraiser for them, all while highlighting how creative this city can be. Some of Storefront MB’s many rad design projects you’ll find around the city include the Cool Gardens design popups (summer), Little Free Libraries, BenchMARK, and all manner of things that make our city more vibrant. Of course, it’s only fitting then that Table for 1200 is also a celebration of design. The aesthetic concept behind the dinner is modelled around Dîner en Blanc™—the Paris-originated now-international outdoor dining experience where people show up dressed in white (after being invited) carrying their own tables, chairs and food to a location that is announced an hour beforehand. Winnipeg's version is more inclusive. There’s no need to tote tables and chairs, while individual ticket purchases are most welcome, as the organizers will email your table number whereby you can sit down for dinner and meet some new friends. What you do need to bring is your credit card or some cash so you can buy wine, beer or cava when you get there. That being said, if you are your table’s captain you should work out with your team just what jaunty design you want to present. In the past, we’ve seen everything from a table all in orange replete with bird feeders, one table made out to look like a Viking ship, and one that looked like the most whimsical garden party we’ve ever seen. And yes, there’s a cash prize of $1,200 up for grabs for best table designs. The location is kept a secret until the day of, while past locations have also included Waterfront Drive, grounds of the Manitoba Legislature, and the area in the east Exchange District surrounding One Lombard Place at Portage and Main. Both Hitzer and Kramer tell us that this year’s location is something else. “For one, it is at an iconic Winnipeg location. It’s going to be pretty magical,” says Hitzer. “We’ve been trying to secure this location for three years,” adds Kramer. On top of that excitement, what fascinates us most about this endeavour is the amount of work that goes into making it happen, particularly from a culinary standpoint. Both chefs have a ton of offsite catering experience. Kramer runs his own catering company [Chef Ben Kramer Custom Catering] where, on top of numerous cool events throughout the year, he and his team also do all the catering for Winnipeg Folk Festival, feeding 3,800 people three times a day for a week. Hitzer, on top of being the chef/owner of deer + almond, is the co-creator (along with Joe Kalturyk) of RAW:almond, the pop-up fine dining restaurant experience that, on top of annually serving multi-course meals featuring some of the world’s best chefs on the frozen Red River, has also gone international in Tokyo, along with locations in Manitoba including Churchill, Gimli and Wasagaming. Kramer and Hitzer have also been collaborating for numerous years outside of Table for 1200. “When we work together, we tend to work together, unlike other events and chefs that I work with where we say, ‘I’ll do this course and you do this course; I’ll prep this, you prep that,” continues Kramer. All bromances aside, the two chefs are really excited to use this year’s Table for 1200 to showcase some under-the-radar Manitoba ingredients, including northern pike, which Kramer has procured from Manitoba’s Bearcat Fisheries, a company he has been working with for 15 years. “It’s under-utilized, and that’s the great thing about events like this,” said Hitzer. “You get to celebrate not only being in Winnipeg’s downtown – which we need to do more of – but also celebrate local ingredients and showcase them to people and hopefully influence them to realize that, ‘oh my gosh, it’s summer, I can go catch that fish and have a delicious barbecue in the backyard,” Hitzer continued. All the proteins are coming from Manitoba (and yes, there are vegetarian dishes too), while Kramer is equally excited about introducing people to a local grain that you still don’t see that often on local menus. You can purchase your tickets, find all the FAQ, and learn more about Table for 1200 at the official website here.